Before you ask, no this game is not about Paris Hilton and it is not based on her (in)famous video either. This is a slot all about the city of Paris and the celebrity, fashion and excitement of the famous French capital. 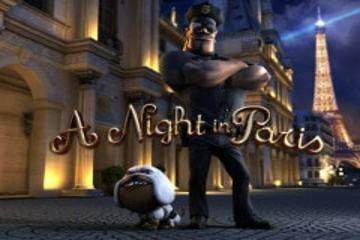 A Night in Paris slots is a good example of a modern 5 reel interactive 3D video slot,from Betsoft. It has good bonus features, including pick a bonus style games and of course, a free spin rounds. If you enjoyed the free version of A Night in Paris slots, here are a few more that might also appeal to you. If you are a fan of online slots, like A Night in Paris, but would rather play for cash, try our Real Money Online Slots section. There you can find casinos with great slot machines, including A Night in Paris. For example, if you are British, you might like to try our UK online slots section, or if you are from Canada, see our Canadian online slots page. Many new online slots casinos offer superb gaming experiences, so although you may never have heard of the brands, there will be plenty of new and interesting games to play.